A 6.2 Magnitude Earthquake Struck East of the South Sandwich Islands. | Chaos Sweeps Away the World We Know! The Disaster, current events & Catastrophe Blog. Forecasts for 2014 to 2022. Read tomorrows news today! Plus current economic, commodities, stock indices and financial news. ← A 6.8 Magnitude Earthquake Struck Eastern New Guinea. April 17, 2012 – A 6.2 Magnitude Quake Struck the South Atlantic Ocean: The 6.2 tremor that hit east of South Georgia (pictured below) and the South Sandwich Islands (a British Overseas Territory) was the third quake today, greater than 6.0 magnitude (M). A 6.7M hit east of Valparaiso, Chile at 3:50AM (GMT); followed three+ hours later by a 6.8M at 7:13AM east of New Guinea, Papua New Guinea; and now a 6.2M in the far south Atlantic Ocean (see map). 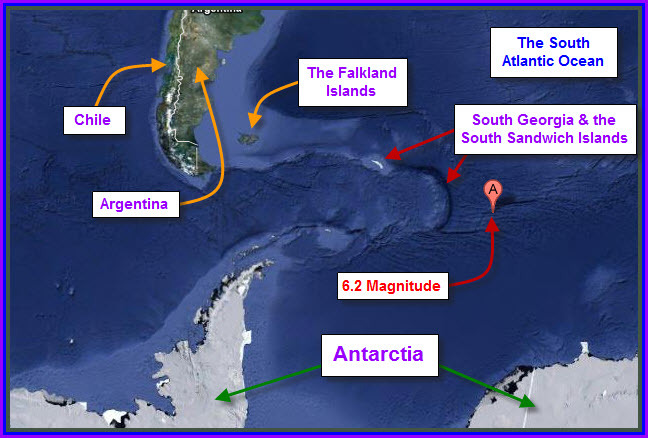 The tremor occurred 349 miles east of Bristol Island, the South Sandwich Islands; 420 miles ESE of Visokol Island, 1,668 miles southeast of Stanley, in the Falkland Islands; and 2,542 miles southeast of Buenos Aires, Argentina. The quake occurred at 6:03PM near the epicenter, 3:03PM in New York, 2:03PM in Chicago, 1:03PM in Denver, 12:03PM in Los Angeles and 7:03PM in London, England. This entry was posted in Argentina, Chile, Earthquake, The Sandwich Islands and tagged A 6.2 magnitude earthquake struck east of South Georgia and the South Sandwich Islands on april 17 2012, The Master of Disaster. Bookmark the permalink. 2 Responses to A 6.2 Magnitude Earthquake Struck East of the South Sandwich Islands. There is a volcano located around that earth quake epicenter. I read an article about it. It has been around for hundreds of years and the tip top of it barely breaks the ocean surface. According to my volcano database their are several that it cold be. The latitude is right,in tha it is around -59S, however the longitude is off. Here are the candiates: Bristol Island, Montaq Island and Thule Island.